I have just finished this applique picture which includes a piece of my son's jeans, my daughter's pyjamas and my husband's shirt. 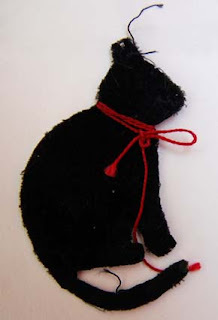 It is based on the shapes of some black lucky cats I was given. I liked the backs better than the front so turned my cats into white ones. 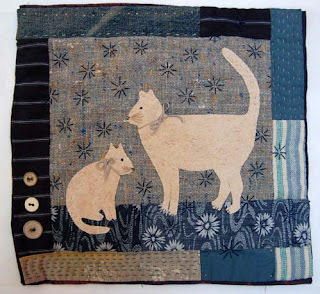 I love your piece, beautiful work and wonderful use of scrap fabrics. 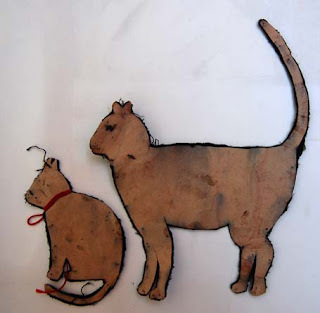 I love kitties and have been collecting old jeans and things, so this year I need to explore my creative side, some more. All beautiful, mesmerizing, creative of course.